Blair House returns to the scene of his biggest victory for the nine-furlong G2 Al Rashidiya, one of two Group races on turf during week four of the Dubai World Cup Carnival at Meydan, UAE, on Thursday, 24 January. The Charlie Appleby-trained six-year-old ran on strongly under James Doyle, who takes the ride again, to triumph over the same trip in the G1 Jebel Hatta sponsored by Emirates Airline on Super Saturday last year. Blair House subsequently finished down the field in the G1 Dubai Turf on Dubai World Cup night. He returns to Meydan on the back of three runs in Australia, including when beaten a short-head by another Godolphin runner Benbatl in the G1 Caulfield Stakes over 10 furlongs at Caulfield in October. The six Godolphin contenders for Al Rashidiya glory also include the first two home in the nine-furlong G3 Singspiel Stakes in the opening week of this year’s Carnival – Dream Castle (Christophe Soumillon) and Racing History (Kevin Stott) – who are both trained by Saeed bin Suroor. Leshlaa (Saeed bin Suroor/Pat Cosgrave) readily beat Blair House in a 10-furlong turf handicap at Meydan last year before finishing a close second to Folkswood over the same distance in the G3 Dubai Millennium Stakes and sixth in the G1 Dubai Turf. The strong team for the G2 contest, which has nine declared runners, is completed by the Charlie Appleby-trained duo of G3 Singspiel Stakes fifth Bay Of Poets (Brett Doyle), who was runner-up in the 2018 Al Rashidiya, and First Contact (Colm O’Donoghue), a Listed winner in France on his latest outing in September. Charlie Appleby reported: “Blair House put up a couple of decent performances out in Australia and has had a little break since. Saeed bin Suroor commented: “Dream Castle won well in the Singspiel Stakes and came out of the race in very good order. “This is a step up to a G2 race, but I have been pleased with his work and I am looking for another good run. Godolphin is well-represented in Thursday’s other G2 race, the seven-furlong Al Fahidi Fort, with the four contenders including the 2018 fourth D’bai (Charlie Appleby/James Doyle, drawn seven of the 13 runners). The five-year-old son of Dubawi lines up on the back of two placed efforts at G2 level over the same distance in the UK. Bravo Zolo (Charlie Appleby/Brett Doyle, drawn eight) was runner-up to D’bai in a course and distance handicap at last year’s Carnival and the seven-year-old returns to turf after coming home a well-beaten fifth on dirt in the G3 Firebreak Stakes in February. Top Score (Saeed bin Suroor/Christophe Soumillon, drawn one), second in a turf handicap over the same course and distance on Thursday, 3 January, and Listed winner Mythical Magic (Charlie Appleby/Colm O’Donoghue, drawn four), a four-year-old son of Iffraaj, also run in the Al Fahidi Fort. Charlie Appleby explained: “D’bai is proven around Meydan and was very competitive throughout his European campaign last year. Seven furlongs is his optimum trip and I would be disappointed if he wasn’t bang there in the finish. “Bravo Zolo is fresh and well. He has showed a good level of form at this course and is back on his preferred surface, which will also help. Elsewhere on Thursday’s card, five-year-old Dubawi horse Bin Battuta (Saeed bin Suroor/Christophe Soumillon) goes for a second handicap victory over 12 furlongs at this year’s Carnival following an impressive display on Thursday, 3 January. He is joined in the same race by the Charlie Appleby-trained duo of Spotify (James Doyle), a Listed winner in France, and Dubhe (Brett Doyle), a lightly-raced four-year-old son of Dubawi who won by four lengths in a Sandown Park handicap on his latest appearance in April. Art Du Val (Charlie Appleby/James Doyle), runner-up in a Listed race at Deauville in October, and Leicester maiden scorer Estihdaaf (Saeed bin Suroor/Christophe Soumillon) both switch to dirt for the extended nine-furlong Al Bastakiya Trial. 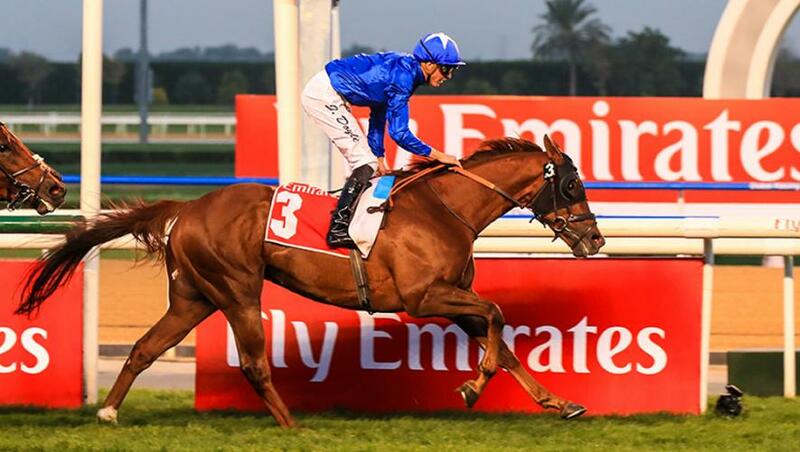 Welsh Lord (Saeed bin Suroor/Chris Hayes) also runs on the dirt in the 10-furlong handicap. The four-year-old finished fifth after missing the break in a similar contest over half a furlong shorter at Meydan on Thursday, 10 January.